Swaffham 7 miles; King`s Lynn 11 miles. 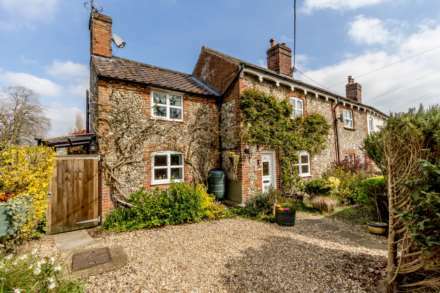 Pentney is a historic and rural village just 15 minutes from the larger village of Narborough with primary school. 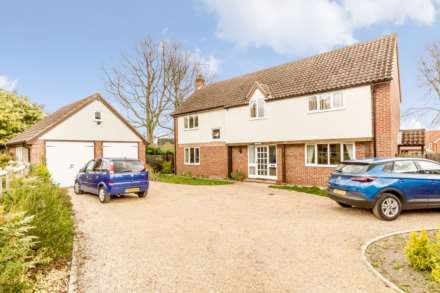 Just 7 miles away lies the market town of Swaffham with its variety of shops, restaurants and supermarkets including a Waitrose, with the larger town of Kings Lynn and a main line railway station just 11 miles away. Entrance door to front, under floor heating, stairs to first floor. Double aspect glazing with UPVC double glazed windows to front and side, under floor heating. UPVC double glazed window to front, under floor heating. Fitted kitchen units to wall and floor, work surfaces over, ceramic sink unit with with mixer tap and drainer, integral oven with ceramic hob and extractor hood over, integral dishwasher, integral fridge freezer, breakfast bar, two UPVC double glazed windows to rear, ceramic tiles to floor, UPVC double glazed French doors opening to rear garden, underfloor heating. Fitted kitchen units, work surface over, space and plumbing for washing machine, air source heating unit, ceramic tiles to floor, UPVC double glazed door to side. Wash basin, WC, under floor heating. Large shower cubicle, wash basin, WC, towel radiator, UPVC double glazed window to rear. Bathroom suite comprising: bath with shower over, wash basin set within fitted cabinet, concealed cistern WC, heated towel rail, UPVC double glazed window to side. Detached brick garage, up and over main door to front. Parking area laid to block pavia, area to front laid to lawn, shrubs to border, shared driveway to the rear with further parking and access to garage. Enclosed rear garden laid to lawn and patio paving, outside lighting, wooden fence to perimeter, gated access to rear parking and garage.